It’s okay if Cher’s “If I Could Turn Back Time” is running through your head today. That’s exactly what Derrick Rose did last night, making a return to his MVP form from a few years ago. He set a career high with 50 points against the Utah Jazz. Not long ago, Derrick Rose was on of the NBA’s kings. And with that, his cards were at the top of the hobby food chain. 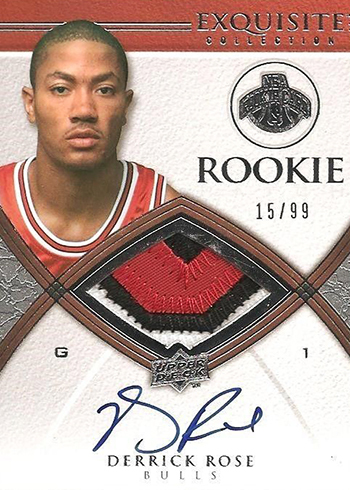 The 2008-09 Upper Deck Exquisite Derrick Rose rookie patch autograph commanded royal sums. But things changed for Rose. Injuries got him and he missed a lot of time. Even when he was back, it was plain to see that we weren’t watching the same player who won the 2011 NBA MVP Award. At least until last night. Even with the struggles of the past few years, the Derrick Rose Exquisite RC is one of the key cards of the millennium’s first decade. It’s not nearly the same caliber but that’s understandable. Whether it’s one night or the beginning of a renaissance for Rose remains to be seen, but it’s great to see him back.